Madame Rachel had everything: a Mayfair address, the title of ‘purveyor to Her Majesty the Queen’, a shop full of exotic, expensive creams and potions. Her clientele were aristocratic, rich – and gullible. This is the true story of Madame Rachel who began life as a poor fish fryer in a disease-ridden, grubby corner of Victorian London. She ended up with a shop in New Bond Street, where her wealthy clients came in their droves, lured by the promise of eternal beauty. What they found there was a con-woman and fraudster who made a career out of lies, treachery and the desperate hopes of women wanting to be ‘beautiful for ever’. 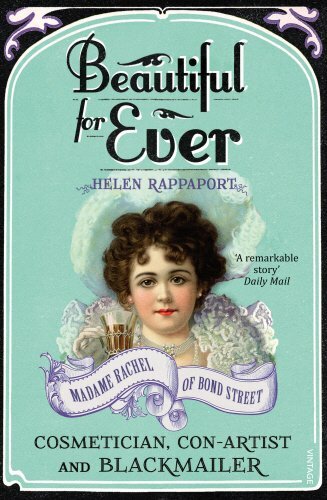 Beautiful For Ever is a thrilling tale of love affairs, scandal, blackmail, high-profile court cases, suicide and fraud, with the extraordinary Madame Rachel right at the centre of it all.